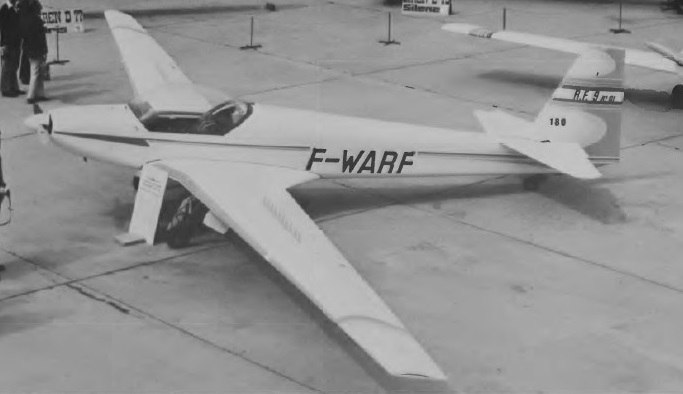 Designed by M Rene Fournier, the RF-9 is basically a side-by-side two-seater development of his earlier Avion-Planeur RF4D and RF5 which were manufactured in Germany under licence by Sportavia Pützer. 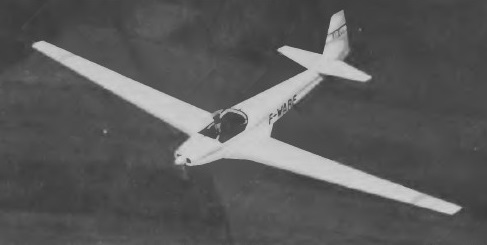 Sportavia Pützer went bankrupt in 1977 not long after the first prototype RF-9 had made its maiden flight on 20 January that year, and while the first production aircraft was being built. The second prototype, which is representative of production aircraft, has a lighter undercarriage, new air brakes and trailing edge flaps. 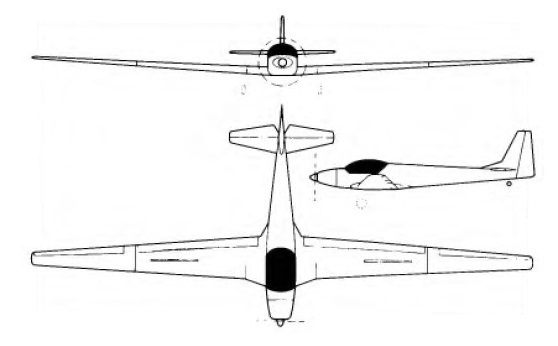 The RF-9 motor glider is intended for training and is of conventional all-wood construction; the cantilever low wings have dihedral from the roots and on the prototype differ from the RF4D's and RF5's in having electrically-actuated trailing edge flaps as well as air brakes in the upper surfaces. The outer part of each wing can be folded inward for easier hangarage, and has connect/disconnect aileron controls. The semi-monocoque fuselage is broadly similar to the RF4D's with a polyester skin, but it is cut down behind the one piece cockpit canopy, which opens upwards and rearwards and gives exceptional visibility. Full dual control is provided. The tail unit is similar to the RF4D's, with a small dorsal fin. Instead of the monowheel and outriggers of the RF4D and RF5, the RF-9 has a conventional inwards-retracting under-carriage and a steerable tailwheel, also retractable. The engine is a 68hp Limbach SL 1700E 'flat four' driving a Hoffmann two-blade fixed-pitch propeller; a variable-pitch prop from the same manufacturer can be fitted if required, as can VHF radio and oxygen equipment. The fuel capacity is 6.6 Imp gallons.